Amongst eleven full-size kitchen displays nestle the best in functional and stylish CDA appliances. EKB Business magazine’s December edition features ex-marine, Marcus Tomkins’ comprehensive kitchen and bathroom showroom; Signature, in Hereford. From our Q-style ovens and extractors, the 6Q5SS and EVQ7BL, to compact ovens and warming drawers, it really shows the variety of our product range. Suited to both traditional and modern design, our products are complimented by British and German kitchen units of the highest quality. Both built-in and under- counter wine coolers are displayed, demonstrating the flexibility of the CDA collection to your lifestyle: “Good service, good product, excellent traditional range of furniture, which suits rural Hereford very well,” The 6Q5SS is an eight function, multifunction oven. 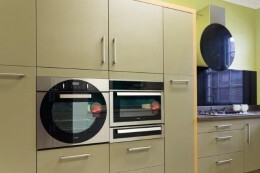 It comes A rated with easy clean enamel, chrome rack sides (with integrated antitilt shelves, including one space saver shelf to make the most of the oven space), interior halogen light, touch control clock/timer, stainless steel with Q style circular design to make a statement in the kitchen. The APH01SS is a slimline plinth heater that provides instant heat where space is at a premium and discreet yet effective heating is required. Cleverly concealed in the ‘kick space’ beneath the kitchen units, stairwells and fitted furniture, a plinth heater eliminates the need for a separate radiator, allowing better use of the kitchen space.